It initially struck me as a bit unfair that the one who lacked understanding missed out and seemingly is judged for his lack. But that’s because I was operating on a presumption that understanding was basically out of our control…either you understand or you don’t. The word “understand,” however, is a verb; it’s something we do. The Greek word translated here as understand means to put together, to consider. So not to understand, at least in this context, means to fail or refuse to actively consider the truth about God that one hears or reads. None of the blind men are justified in coming to the conclusions that they reach. Given the bounds of their knowledge, are any of them justified in coming to an elephant-conclusion? The parable has always seemed to me a wonderful argument against holding any theory of truth. Hello again, Keith. Thanks for your input. Am I to assume then that you hold no theory of truth? A deflationary notion, is all. Well, I had to refer to my Philosophical Foundations for a Christian Worldview to remind myself of what a deflationary theory of truth is. So, is it accurate to say that you believe “there is no such property or relation as truth”? Maybe that’s how a realist would put it (and has, I suspect), so it misses the mark. The realist would also claim that a minimalist account insists that there is no mark to hit – also a mischaracterization, and a conceptually telling one. Rather, the application of the labels ‘property’ or fixed ‘relation’ to truth does not apply in the realist sense. Those labels and their attendant theories can categorize, but not capture truth. 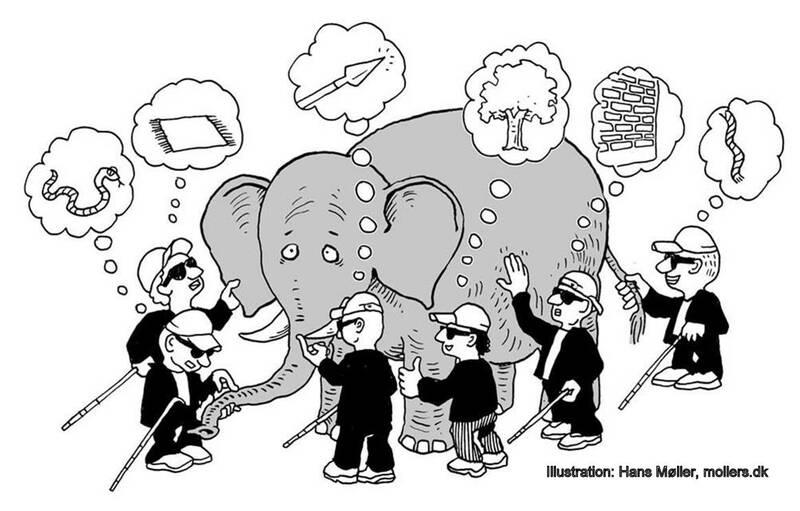 It is true, for instance, that the blind men’s elephant is the same as the sighted person’s elephant, but not precisely, not realistically. Well, I’m not interested nor schooled enough in antirealist theories, so I’ll blissfully stick with the common sense understanding that there is such a thing as truth and that it can be rationally apprehended. Sure. The point is: our knowledge is all squishy, to varying extents. We have to be careful about thinking our conclusions are solid, things-in-themselves. If we forget that, we end up across the line between reason and rationalization – like the blind men, or the sighted person who laughs at them and says, “Can’t they see? That’s plainly an elephant!”. Thanks for reading and commenting, handian. May you continue drawing ever nearer to Him.